Water may look placid, but its capacity for strangeness seems unlimited. Unique among Earth’s liquids, water has quirks that make scientists and weathermen love their jobs. It inspires awe with massive and bizarre storms, swirls, clouds, and even stranger molecules and quantum secrets. From the oldest water ever found to the mystery of where H2O originally comes from, this life-giving liquid can be scary and magnificent enough to belong to the realm of fantasy. Flames and water do not mix, but a rare kind of cloud forms over fiery events like wildfires. Most recently, these so-called pyrocumulus clouds appeared during Hawaii’s 2018 Kilauea volcano outburst. They are cut from the same cloth as most other dynamic weather systems. Hot air rises to condense into clouds. But the scarcity of pyrocumulus clouds makes them difficult to study. 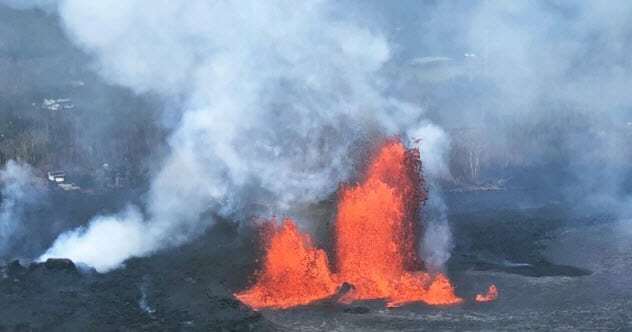 The Kilauea batch was even more peculiar. While they retained their normal thunderhead appearance, the clouds preferred to manifest over fissures. Usually, fire clouds only hover around the actual eruption or in the vicinity of a scorching wildfire. Hanging around volcanic vents adds a sting that pyrocumulus clouds do not usually have. Sulfur dioxide from the fissures can cause acidic rain that damages delicate plant life. For people, there is the issue of “vog,” or volcanic smog. The presence of the clouds at the vents could boost the levels of this haze and cause health issues, including irritated skin and eyes. The Mpemba effect has blown educated minds throughout history, including Aristotle and Francis Bacon. They observed what seemed like a freak of nature—that hot water freezes faster. This phenomenon was named after Erasto Mpemba, a Tanzanian high school student, whose studies confirmed the ancient thinkers’ observations in 1963. He showed that the effect happens when hot and cold bowls were left in identical subzero temperatures and the warm water turned to ice first. There are several theories to explain this madness. In the 1980s, Polish physicists attempted (and failed) to prove that warmer water might have less heat-retaining gas. A more likely reason could be that when hot water steams, evaporation reduces the mass that needs to be cooled. Another factor might be warm water’s coolest point. In a container, cold liquid sinks to the bottom and pushes the hottest layer to the surface. This creates a current that speeds up freezing. However, the precise process that enables hot water to chill quicker than its colder cousin remains a mystery. One of H2O’s greatest enigmas concerns its origins. Nobody really knew where all the seas and lakes came from. One popular theory suggested that water was seeded on our world as comets and asteroids smacked into the surface. 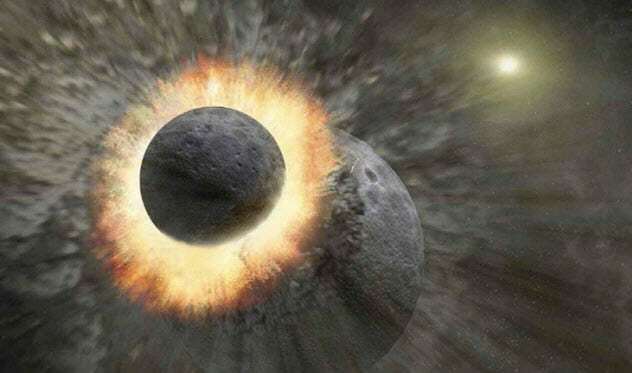 As to when, it supposedly began after The Giant Impact—the collision with another planet that nearly wrecked Earth but formed the Moon. This celestial horror show happened 4.5 billion years ago. But a 2018 study showed that water was likely already present before the catastrophe. When terrestrial and lunar rocks were compared, their oxygen signature was nearly identical. The same researchers also found that impacts did bring more water afterward, accounting for 5–30 percent of Earth’s water. 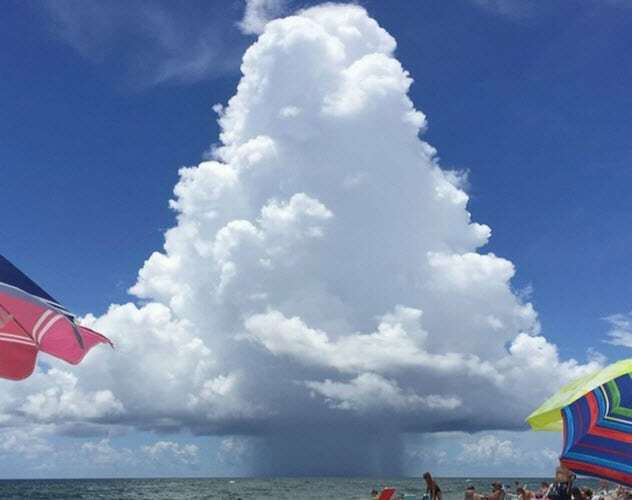 On July 17, 2016, Rick Geiss was relaxing near an Alabama beach when he noticed a bizarre cloud. He took a picture of the puffy cone but only shared it two years later. When the massive, upright thunderstorm hit social media, it looked so unreal that some called the photo a fake. Pulse storms form differently than bigger showers. Usually a thunderstorm is triggered by a cold front. But in this case, only heat is needed. A rapid updraft pulls enormous amounts of water vapor into the air and the trademark shape. Within 20 minutes, rain falls. It only rains from one spot because the water plunges back out the updraft tube. The cloud kills itself as the downdraft cancels out the updraft, and the whole storm collapses within half an hour. Something like this is possible. If glaciers cover enough ground, more of the Sun’s heat will be reflected back into space. Temperatures drop, more ice forms, and more heat is blocked. It is a vicious cycle that results in the opposite of global warming—runaway cooling. Among the strongest evidence that Earth’s ice went berserk is that glaciers reached the equator. Despite this sign of an extremely cold world, experts are openly divided. 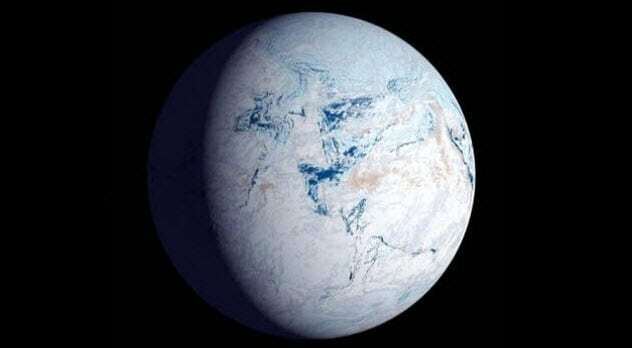 The anti-Snowball faction agrees that Earth faced its worst glaciation during the Cryogenian. They even admit that every continent saw its share of these frozen mountains. However, they found rocks with water-induced weathering, showing that the Cryogenian experienced warmer times with liquid surface water. This meant that the planet never fully became a Popsicle. If the anti-Snowballers are correct, it leaves a mystifying riddle. Faced with its greatest freeze, what stopped Earth from going out of control? Huge ocean whirlpools are not something that happens only in fantasy pirate movies. They are real and can span a frightening diameter of hundreds of miles. Another fun fact for the nervous sailor: These eddies are common. 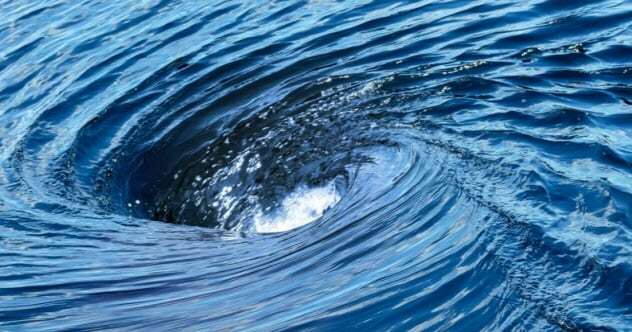 For decades, scientists theorized about whirlpools traveling in pairs. Called modons, they were seen for the first time in 2017. The two newly discovered swirls stayed friends for six months and crossed the entire Tasman Sea together. They represented bizarre fluid dynamics. Single eddies usually go west. But when these mammoth vortices teamed up, swirling in opposite directions, they went east at 10 times the normal speed. The Tasman couple was discovered via satellite photography. Incredibly, when researchers combed through old images, they found nine more modons since 1993. For some reason, eight spawned around Australia. It remains unknown how modons merge, but their tails fuse into a single U-like funnel that allows the phenomenon to stay active for months. Coupled with their extreme speed, modons might also act like watery subways, shuttling nutrients and ocean life to new places. An experiment in 2017 added another bizarre fact to the almost 70 ways that water is unlike any other fluid. The inspiration for the test came from ice. More specifically, its ability to exist in two forms while solid, where molecules are random or in a neat pattern. 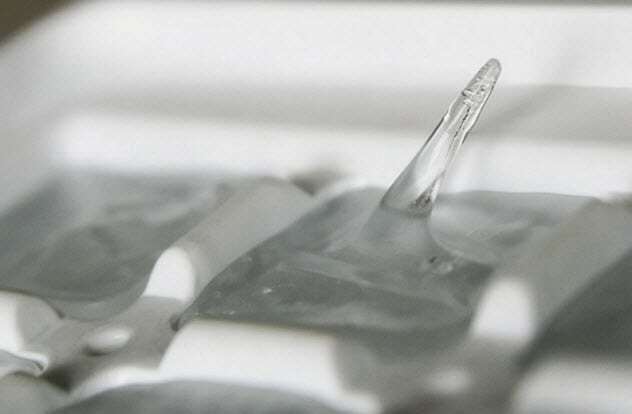 The haphazard version is the world’s most abundant type of ice and can shift between states of high and low density. Scientists wondered if liquid water retained this ability in some way. Using X-rays, H2O molecules were tracked to map their progress from an icy state to room temperature. The water morphed from a frozen condition to a thick liquid. Almost instantaneously, it then moved on to another lower-density liquid. The end result was fascinating. Apparently, at room temperature, water cannot settle as either a high- or low-density liquid and fluctuates in and out of both. Technically, this makes water two liquids instead of one. In 2018, scientists discovered a really unusual thing. 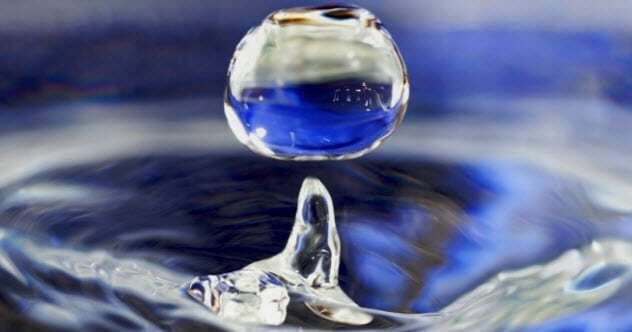 At the quantum level, water is also a double liquid. When a person takes a swig, he or she is actually drinking two kinds. They taste and look the same. But at a chemical level, there is a clear difference. 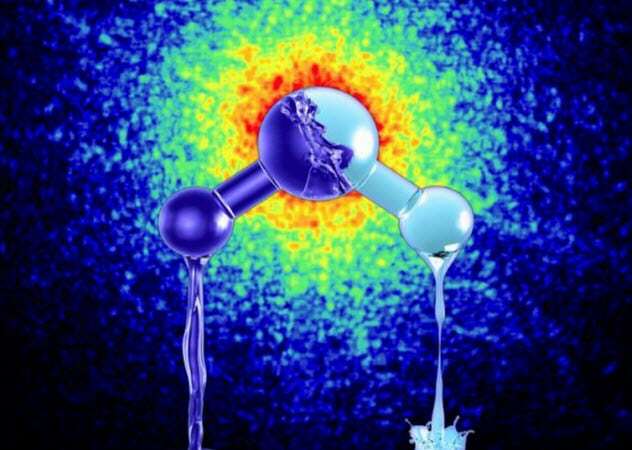 H2O describes water’s molecular build—two hydrogen atoms clinging to an oxygen atom. Duality begins at the direction the hydrogen atoms’ quantum particles spin. When they twirl in the same direction, something called “ortho-water” is born. “Para-water” results when each hydrogen atom spins in its own direction. During a first-of-its-kind experiment, an electric field separated the two waters before exposing them to supercooled diazenylium molecules. The para-water reacted about 25 percent faster to form H3O+ (water with an extra proton). This proved that the two kinds were not only separate but also behaved differently. When the most ancient pool was located in 2011, it was not on Earth. 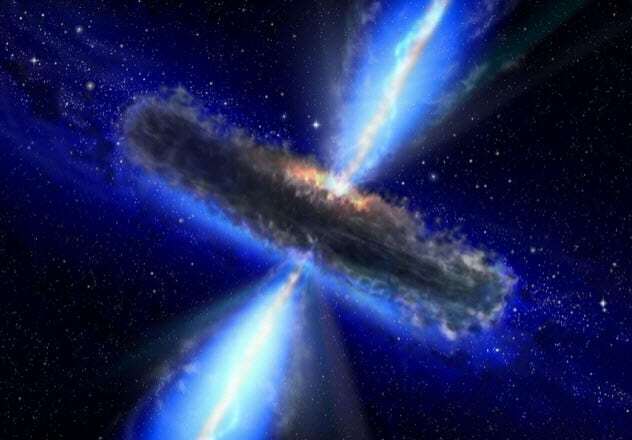 The vapor hovered 12 billion light-years away and was 12 billion years old. Additionally, the largest mass of H2O ever detected was mind-bendingly huge. If all the oceans on Earth were multiplied by 140 trillion, only then would they equal the single space cloud. The Milky Way also came in second. The vast expanse was calculated to contain 4,000 times less water vapor than this thing. However, size was not its only surprise. The cloud’s age is evidence that water existed for almost as long as the universe itself. But that’s not all. The vapor surrounds a black hole worthy of its presence. APM 08279+5255 is a supermassive quasar, one of the most powerful and brightest objects in space. APM 08279+5255 could swallow 20 billion of our Sun at once, and it radiates more energy than a quadrillion suns. The cloud also revealed that there was enough gas present to swell the black hole into a true monster—about six times bigger than its current size. No liquid beats water when it comes to weirdness. While other fluids become denser as they solidify, water becomes lighter. It is the reason why icebergs float and lakes do not freeze all the way to the bottom. Water has an unusually tough surface tension and high boiling point. Compared to most liquids, a surprising number of chemicals dissolve in water. In 2018, scientists discovered the elusive answer to what makes water unlike any other liquid. Water molecules like to stick to each other in such a way that they resemble a pyramid. It takes five molecules to make a pyramid cluster, which can stick to others to form larger pyramids. Amid the Egypt festival is a chaotic arrangement of other molecules. Bizarrely, it is the dual nature of pattern and chaos that allows water to have its unique properties. Researchers proved this when they adjusted the molecules and made ice sink. Messing with the pyramids also canceled out water’s other special properties. However, “normal” water is deadly to life. Without its weird properties, blood cannot flow and nutrients cannot be absorbed. 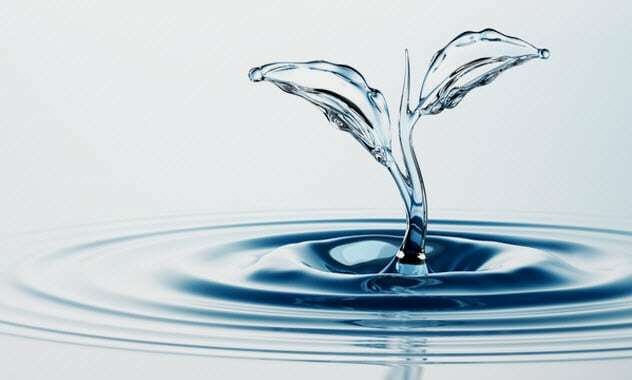 For more weird water tales, check out 10 Toxic Bodies Of Water and 10 Ways Water Can Kill You.